Although I don't have dry skin, I love a good moisture mask. There's nothing better than applying a nice thick layer of hydration to parched skin - whether you had a big night out or your skin just needs some TLC, moisture masks are great for perking up your complexion. Obviously, pair this with plenty of water drinking and your skin will certainly thank you for it! 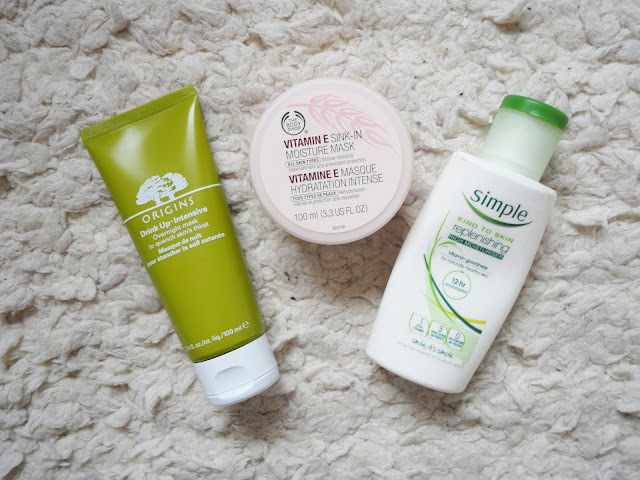 Today, I thought I'd talk about some of my faves, from high end to budget skincare. I've posted about the Origins Drink Up overnight mask a few times before (here and here) so if you want to see full reviews check those posts out. This mask is probably my favourite of the three, as I notice such a difference the next day when I've used this. It smells absolutely divine, and it's such a pleasure to apply it. It sinks into the skin really well for a mask and doesn't leave any residue. I love using this if I've been neglecting my skin and it needs some hydrating, or if I've been out the night before and my skin is suffering. At £23, obviously it's a higher end product (for me anyway! ), so I use it sparingly but this tube will definitely last me a while as it's not a daily use product. I maybe use this a couple of times a month. My second recommendation is The Body Shop Vitamin E Moisture Mask. This is a cheaper option at £14. I got this for my trip to America last year to use on the flight. It's 100ml, so fine to take with you onboard, and I basically just kept reapplying this throughout the flight to stop my skin getting dehydrated. This definitely feels heavier than the Origins mask, and I can feel this on my skin much more. For flights, I don't mind this, as I don't wear makeup whilst flying and it makes me feel better knowing there's a good layer of moisture on my skin! It's a weird jelly-like consistency, and you don't need much to cover your face, so this is another one that will last a while. I'm not a huge fan of the scent - I much prefer Origins - but I can see past that as my skin feels much more moisturised after using this. On the tub, it does say that you leave it for 10 minutes then wipe it off, but I usually just leave it on overnight and I've never had a problem with that. My final recommendation is a fantastic budget option from Simple - the Replenishing Rich Moisturiser. Now, technically this isn't a 'moisture mask', but it's a pretty rich moisturiser so I thought it would be good for anyone with oilier skin that doesn't want to put anything too heavy on the skin. It's only £4.19, and like the others, you only need a small amount each time you use it so it will last a good while too. I also like that this is unscented, so a great one to try if you have more sensitive skin. Have you ever tried any moisture masks? Let me know your faves in the comments!